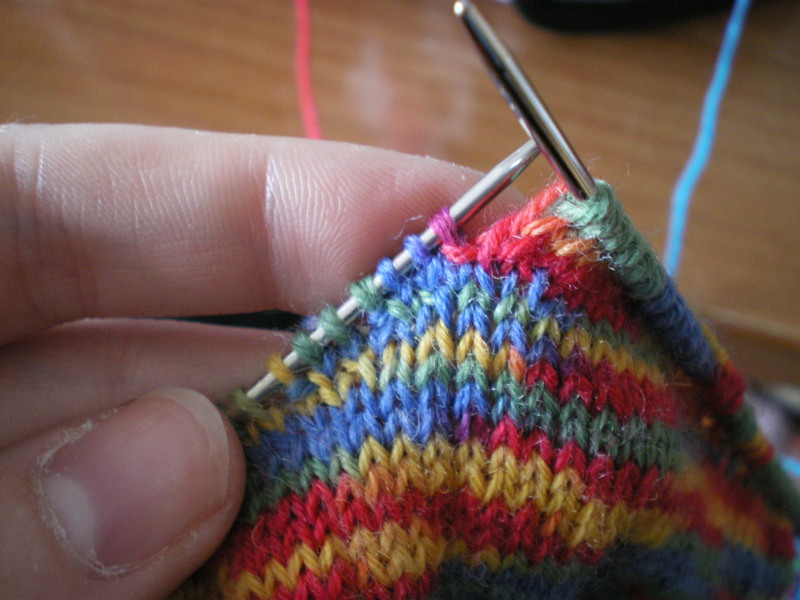 Ok, so now you have your sock(s) and you’ve knitted to the required number of inches before the end of the foot. Now it’s time to increase for the gusset. Again, the pattern calls for Kf&b, but I personally prefer M1R and M1L, as they produce a nice straight line. 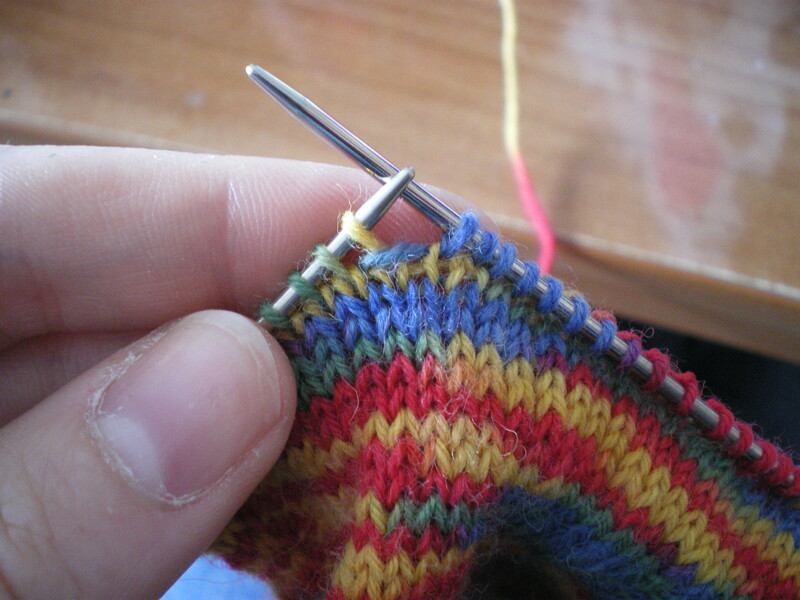 So feel free to replace the line Gusset round 1 needle 2 with K1, M1R, knit to last stitch, M1L, K1. 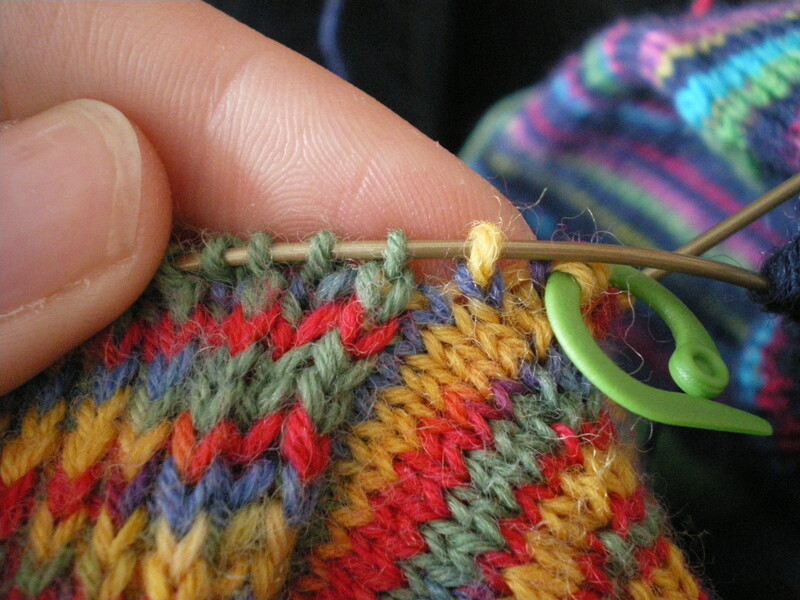 I would suggest putting in an open/lockable stitch marker so you can easily keep track of how many stitches you’ve increased. 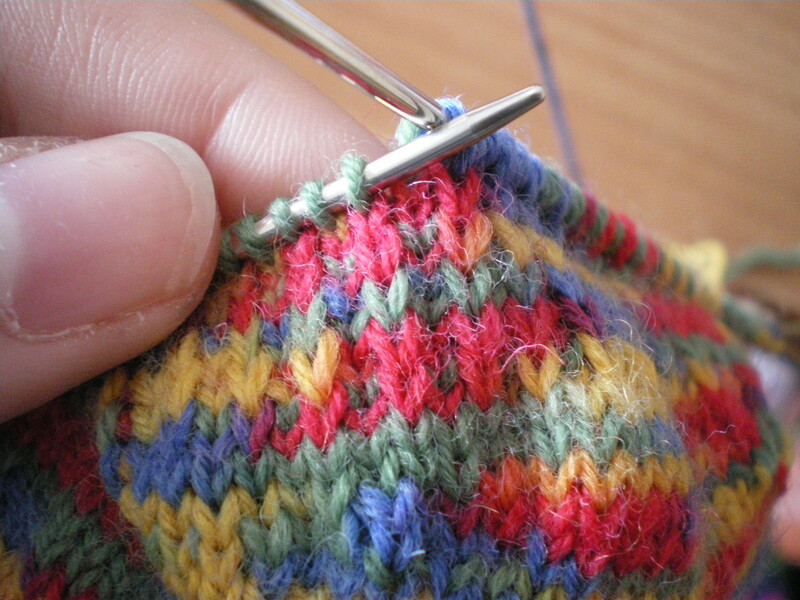 See the blue bar between stitches here? 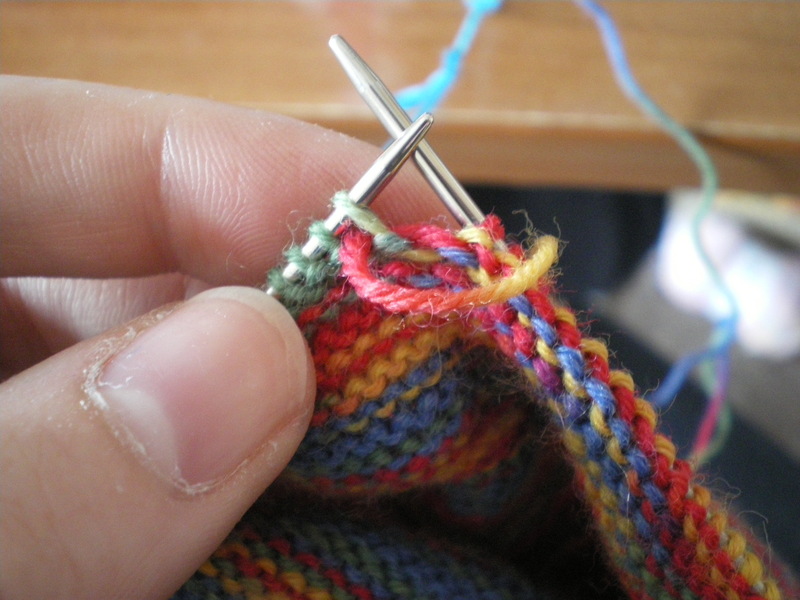 Now you need to knit into the back of the stitch (again, I use the needle to pull some of the give over to the back to make it easier). 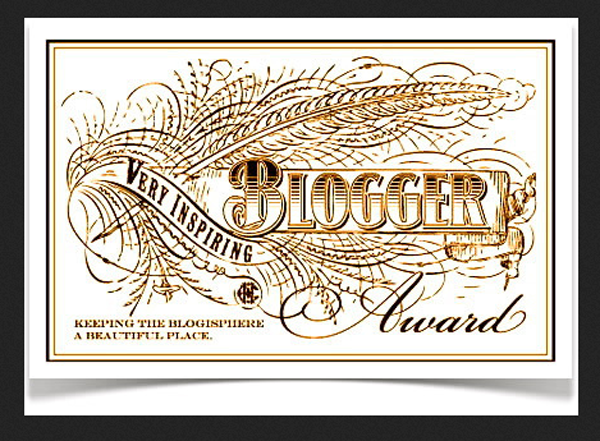 and this is the row you won’t increase on. 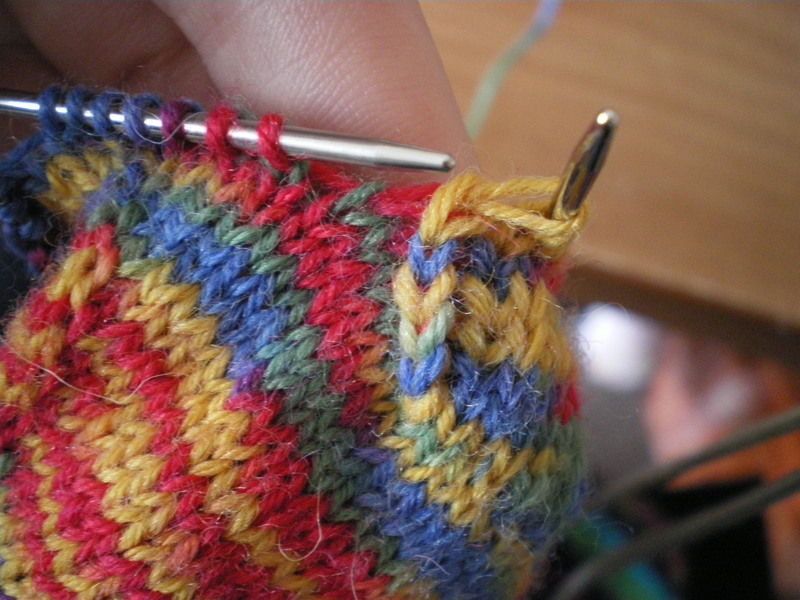 It also feels tighter than a standard knit stitch. 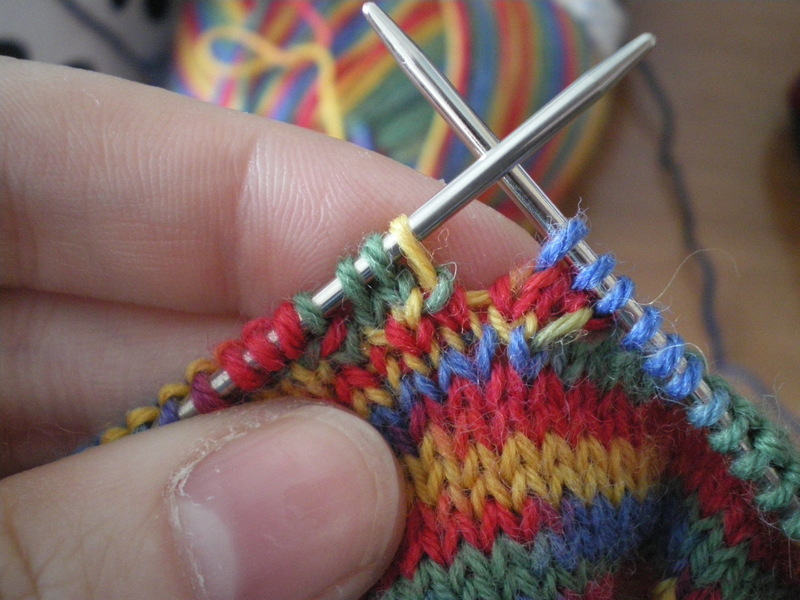 After all the increases, it’s time to move onto the short rows and wraps and turns. 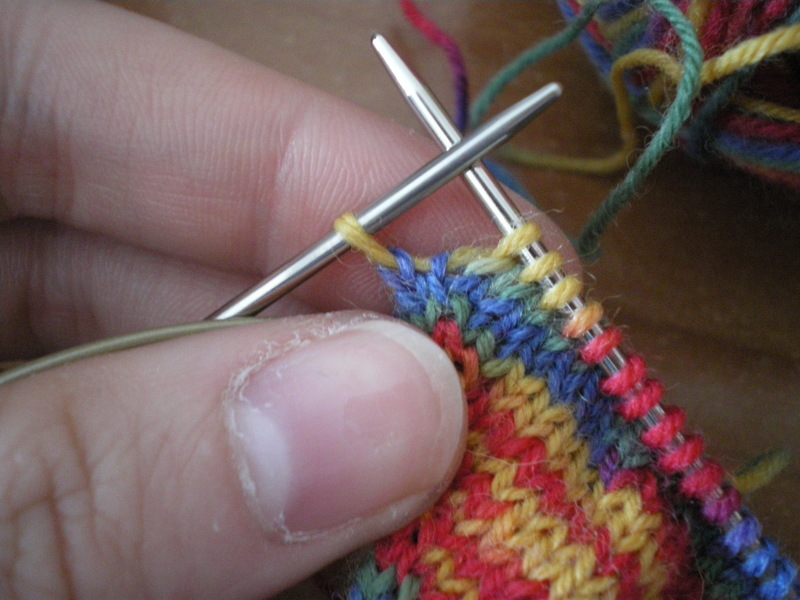 On the knit side, you work wraps by bringing the yarn to the front, slipping the next stitch from left to right, taking the yarn to the back and returning the stitch to the left needle. 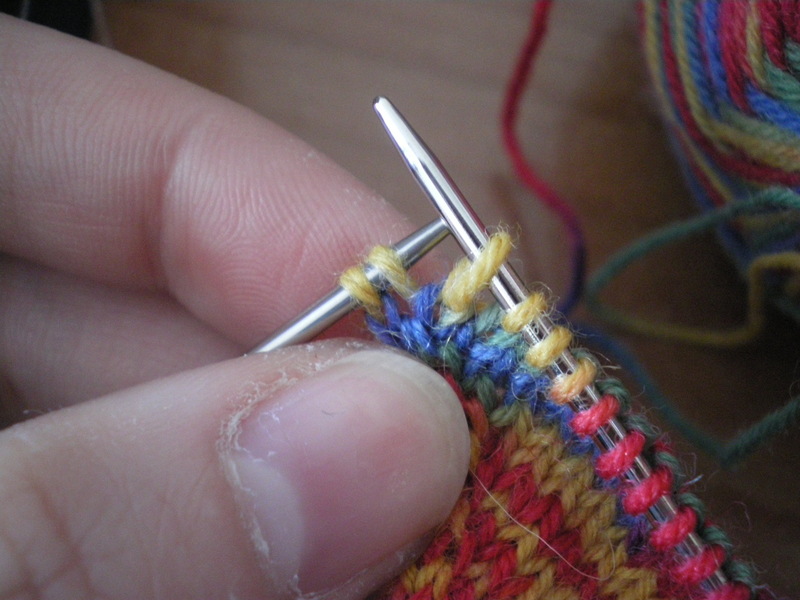 Here you can see the yellow stitch on the left needle has been wrapped (in blue.) 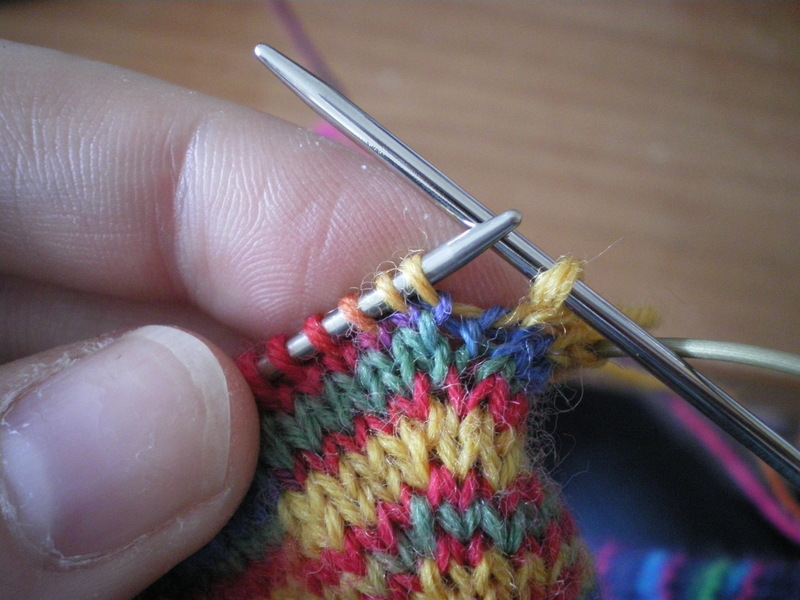 You now turn the work around and start purling, including purling the first stitch. 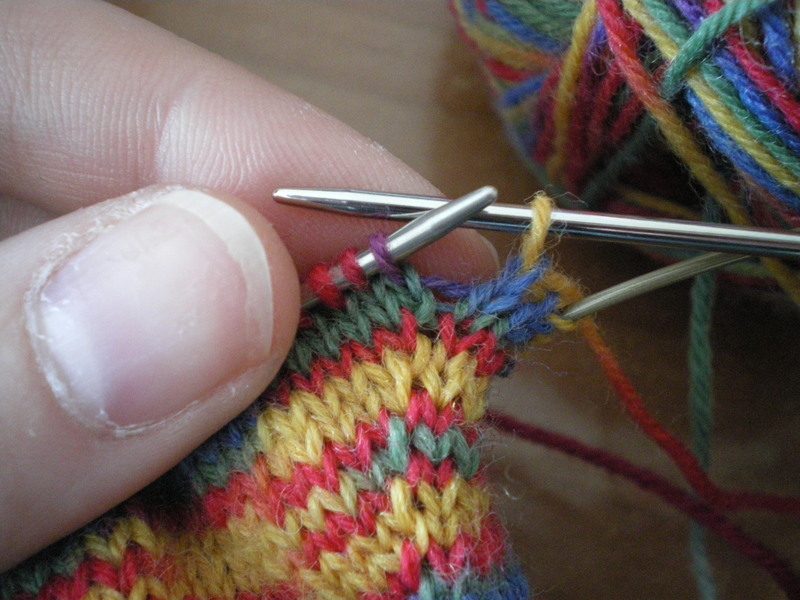 Then you are ready to turn the work and start knitting again. 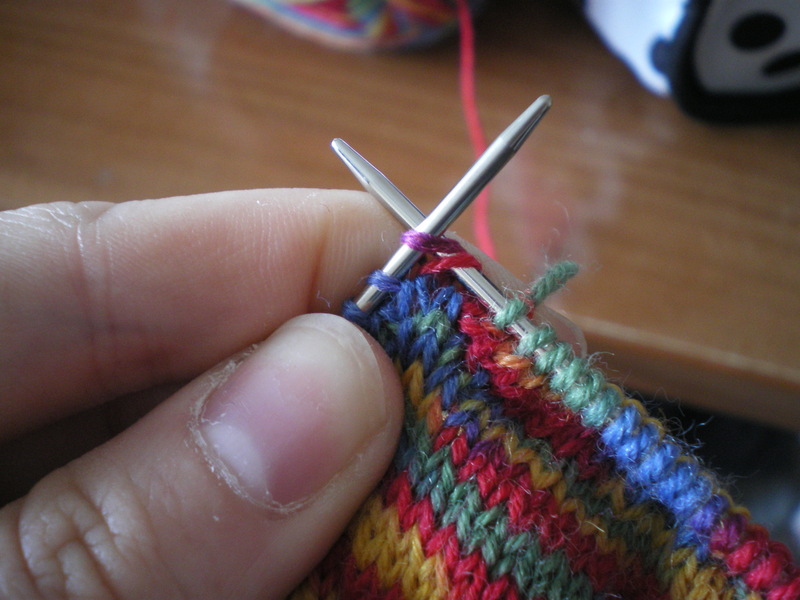 The bright red stitch further down the needle is the wrap, the darker one is the stitch. Now you can knit these together, just as you would for k2tog. 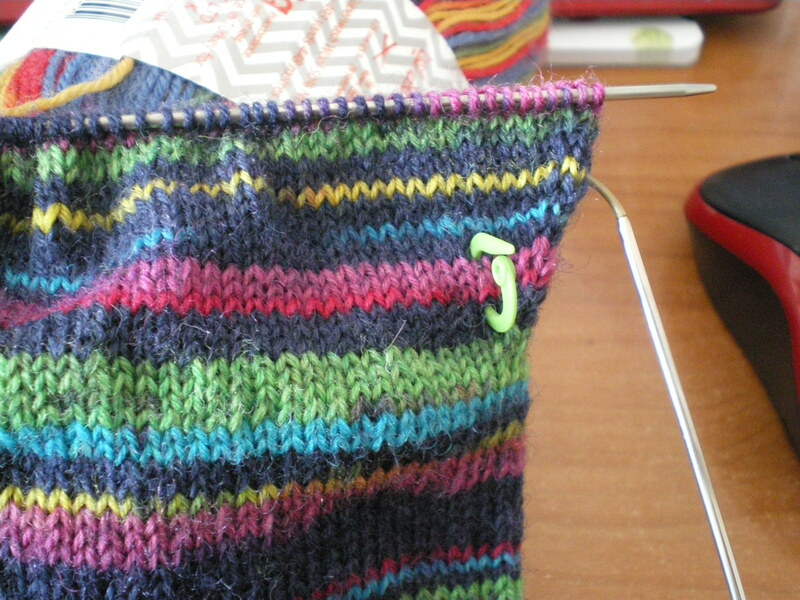 you need to put the wrap (green) onto the left needle with the stitch it’s wrapping (yellow). You can then, as before, basically just k2tog. Some of the columns stand out more than others. 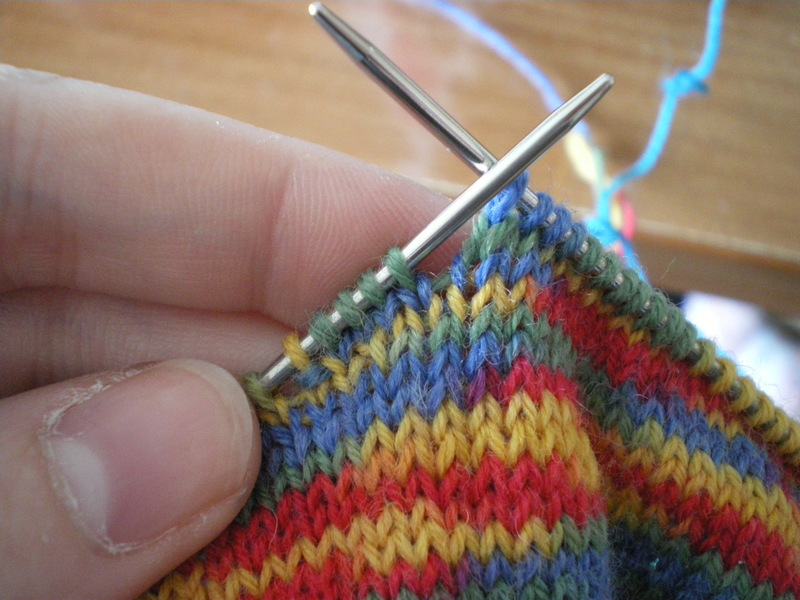 In particular, the column of the stitch first on the left needle stands out. 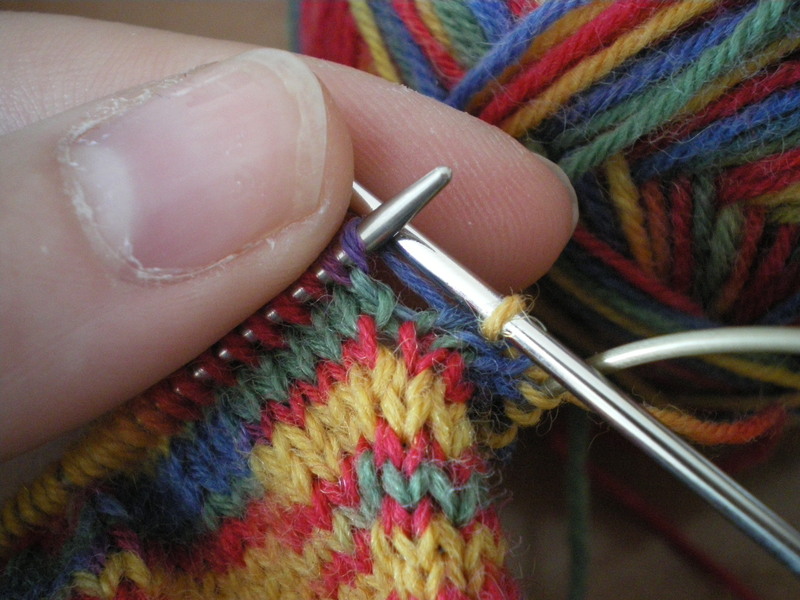 This is a stitch you need to slip. The ‘hidden’ columns are knitted. 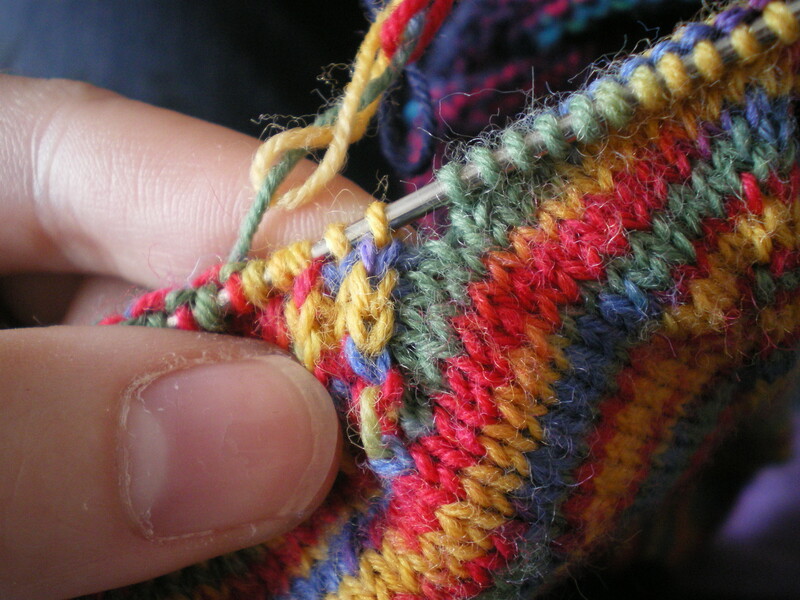 You can start to see this pattern appear right from the first row of slip stitch knitting, but it is harder to photograph, so this is after a few rows. 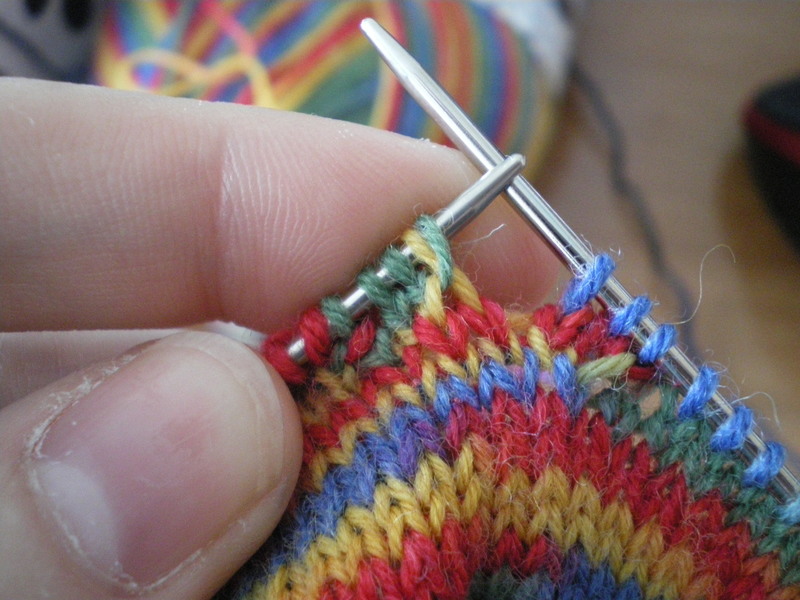 This stitch is the last stitch to get included into the heel flap, and will be done almost as an afterthought. 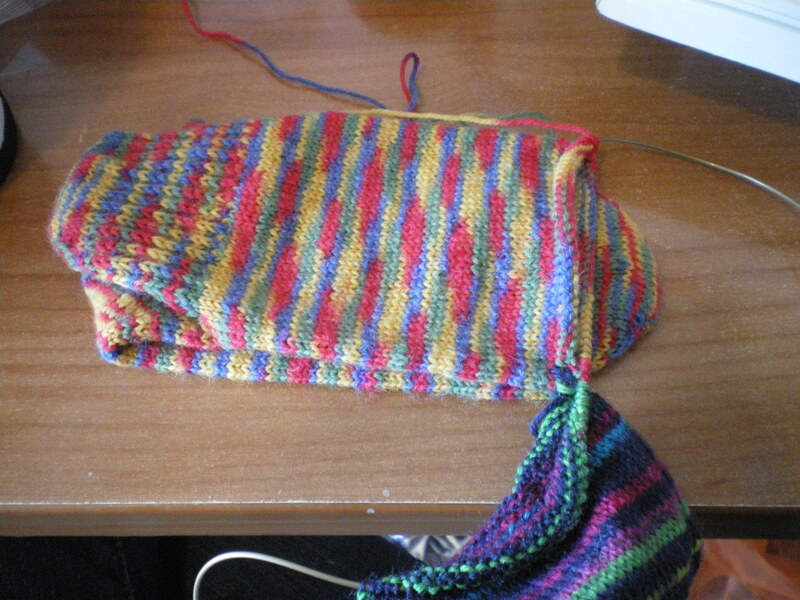 Don’t fudge this one, you’ll get a whole because the two bits (the main sock and the heel flap) are almost two separate parts, and they won’t play nicely together without it. 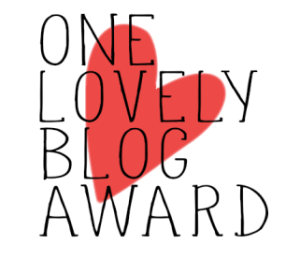 Next week, I will be talking about the ribbing and cast off. See you then!